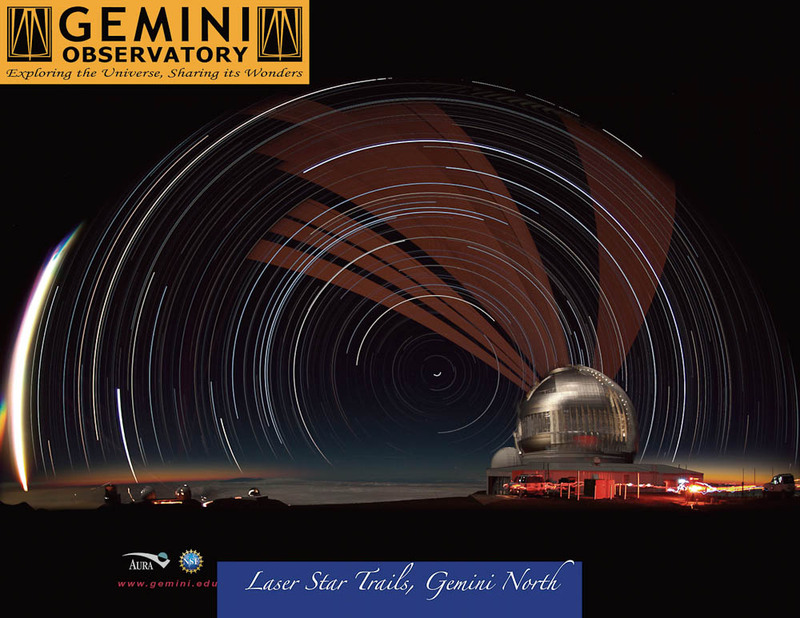 This long-duration fish-eye view of the Gemini North telescope facility shows the propagation of the laser guide star (LGS) laser on the night of May 21, 2010. Featuring the sky over Mauna Kea (looking north), the glow of both dusk and dawn, as well as star trails, fill the sky and provide a backdrop for the orange glow of the Gemini LGS laser as it tracks through the sky. The LGS laser from the W.M. Keck Observatory and the peak of Haleakalā on Maui can be seen on close examination of the image. The bright streak on the left is the setting moon. From left to right, the observatories are; Subaru, Keck (twin domes), NASA IRTF, and CFHT (just behind Gemini). The images used to create this single image were captured as part of a time-lapse movie and then stacked in Photoshop®. 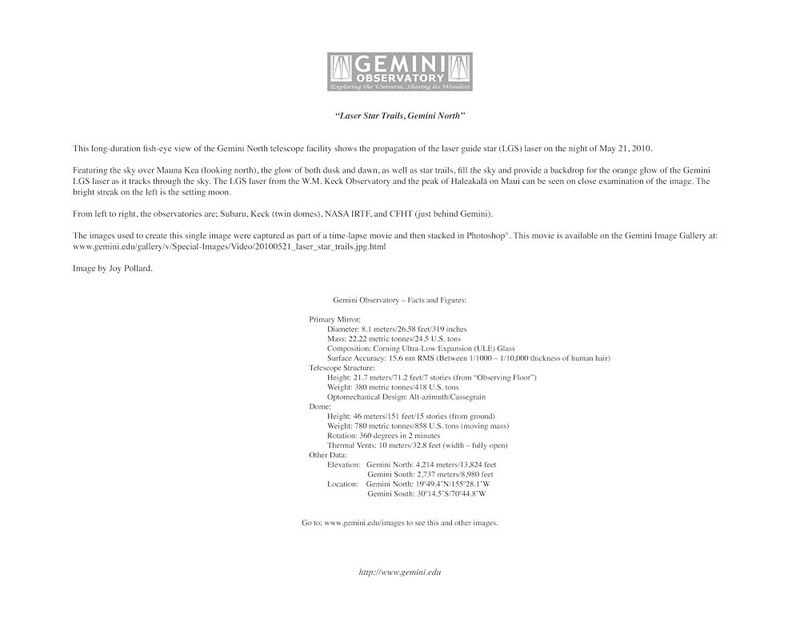 This movie is available on the Gemini Image Gallery at: www.gemini.edu/gallery/v/Special-Images/Video/20100521_laser_star_trails.jpg.html Print downloadable as: Print Quality PDF (2.3 MB) Full Resolution TIFs Front/Image ( MB) | Back/Text ( MB) Medium Resolution JPGs Front/Image (225 KB) | Back/Text (147 KB) Gemini Observatory Image/Video Usage Policy Image is available without text here.